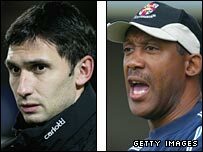 Bury have sacked manager Chris Casper and director of football Keith Alexander with immediate effect. A club statement said the pair had "lost the confidence of a large majority of the fans". "The decision has come at a difficult time, but it was felt that the decision had to be taken earlier rather than later," it added. Casper had admitted that he feared for his future as boss after Saturday's 3-0 defeat at Darlington. Former Manchester United trainee Casper became one of the youngest managers in Football League history when he was appointed by the Shakers in October 2005, aged just 30, and helped them avoid relegation from League Two that season. He had retired from playing after breaking his leg in two places in December 1999, and later won an out-of-court settlement over the tackle which ended his career. Former Lincoln and Peterborough boss Alexander was appointed as director of football just after the end of last season. Bury finished in 21st place last season, two places but 14 points above the relegation zone - while Casper offered to resign after they were expelled from the FA Cup for fielding an ineligible player. Despite knocking Leeds out of the Johnstone's Paint Trophy in November, the Shakers are currently 19th after a run of nine games without a win. The club were also set to make an additional statement later in the day.